ALES are fermented at warmer temperatures (around 60 to 70 degrees) for shorter periods than Lagers. The yeasts sink to the bottom of the vessel after fermentation giving this beer a fruity, spicy, and yeasty flavor. Ales are typically more robust in taste, more complex, and best consumed cool (50F or warmer) rather than cold for best taste results. The name with Ale includes everything from Pale Ale, Amber Ale, etc, then also includes porters, stouts, Belgian specialty beers, like wheat beers, and German specialty beers. PALE ALE has hoppy flavor and aroma, gold or copper colored ale, with low to medium maltiness. The name came from comparing the beer to be paler than a Stout or Porter. The different styles of Pale Ale are all fairly similar due to the ingredients and the recipes followed. When making Pale Ales, it is most important to use quality hops and hard water, which gives its pronounced hop flavor and its clarity. 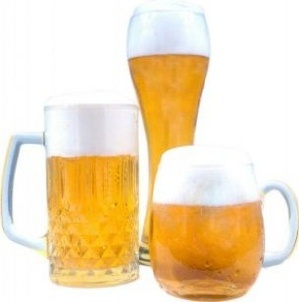 There are different styles of Pale Ale; English, the India (IPA), and the American. BROWN ALES known for their russet color, having distinctive malty aromas. With the different malts added giving different flavors, such as caramel malt, chocolate malt. American versions are always bigger in gravity, bitterness, and alcohol. English brown Ales use two varieties of hops, Fuggles, a rounder, earthy tones, and East Kent Goldings, complex without being overbearing with herbal character. ENGLISH PALE ALE has a reddish amber color, earthy, buttery, malty flavors and a dry character due to the high sulfate content in the water. AMERICAN PALE ALES tend to be heavier with Hops, giving a more of a malty flavor than the other two. IPA  INDIA PALE Ale  Originated in England in the late 1700s to transport to India to their colonies. By adding more Hops, a natural preservative, helped the beer survive the long trip. The IPA is usually stronger and has more pronounced hop flavor due to the higher alcohol content, and the hops acted as a preservative in the long transportation from England to its colonies in India. ENGLISH BITTER  As the name suggests a high hopped beer, it is not the case. It is from the comparison to English Mild, brown ale with only half of the bitterness. Bitters are generally made from pale malt, with a distinct flavor from the caramel crystal malt. English hops are featured, though usually the aroma is low. It is often found in pubs, with a very low carbonation level, served from hand-drawn beer engines. Boddington's Bitter represents the style fairly well, even up to the pub-draught style can. Three classic styles of English Bitters; the Ordinary(mild), the Special(Medium strength), the Extra Special(a strong bitter). The character comes from the traditional hops used, such as Kent Goldings, Fuggles, or Brewers Gold. The alcohol follows the range from mild to strong. SCOTTISH ALE  these Ales are usually darker, have more malt, and less carbonation. There color ranges as well as the strength in the order of the Scottish Light(60 Shilling), Scottish Heavy (70 shilling), Scottish Export(80 Shilling), and the Strong Scotch(wee heavy). The terms shillings date back to when beer was taxed by gravity, and strength, and still is used to order a Scottish Ale in a Highland Pub. Since Hops were not grown in Scotland, they had to be imported. Some frugal brewers would cut back on the amount of hops and made more malt Ales, making this darker, higher in alcohol, and have a slight smoke flavor making Scotch Ales. Scottish Ales are lighter and for everyday drinking Ales. BELGIAN STRONG DARK ALE  A favorite among Belgians hundreds of styles of beers, with its dark color, malty, low hop flavor and high alcohol content. This style beer uses a strain of yeast that adds to its biscuit flavor, with fruity and spicy tones, and high in carbonation. Served best in a goblet to allow its aroma be smelled while drinking. Known as the champagne of beers, a beer to be savored, not slammed.